Long-time readers know that I knit socks exclusively on two circular needles. 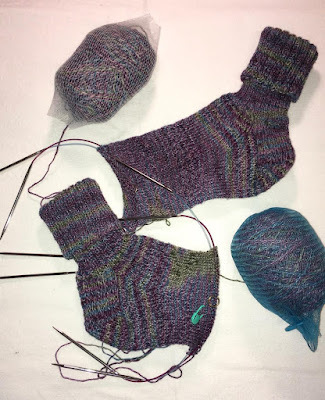 A woman in the Monday afternoon Needlers group wanted to learn the technique, so I cast on a pair of socks to knit along with her. She mastered the heel flap, heel turn, and the gusset without any difficulty. The yarn I'm using for this pair was given to me a couple of months ago by Julie W.
Val S. is enjoying the technique, and I doubt that she will return to knitting socks with double-point needles (DPNs). Have you taught someone a "new" technique? Blogger seems to be playing tricks: currently it's not emailing comments left on posts for many bloggers, so this is not something that I can fix. I enjoy responding to comments, so I hope the glitch is worked out soon. If you've recently left a comment and I haven't responded, it's not because I don't appreciate your thoughts, it's because I haven't seen them. Until this issue is resolved, I'll check my blog daily for your comments and reply when I can. Thanks for your patience and for continuing to read and comment on my posts. It is fun to pass on the knowledge! So any people are mystified by the yarny process. My knitting skills haven't been tried out in about 40 years, but I keep thinking I want to pick it up again. My grandmother taught me as a kid. I've noticed too that Blogger has been acting strange lately. I use DPNs...the whole knitting socks on circular needles confuses me - lol. How nice of you to take the time to teach someone else a new technique. I have tried the two circular needles but I always go back to my DPN’s. I think it’s because it’s what I learned on and I’m most comfortable with them. I would love to learn your technique...too bad I live so far away! I would take sock lessons from you! Well lets see...I do teach carving to little kids a couple of times a year...not really a new technique. Well, I love the socks. and I love you teaching. Once a teacher always a teacher~ Hi haven't taught a new technique lately. I was a pro at teaching moms to breastfeed! I was great at teaching how to give a baby a bath...(terrifying for new parents) hahaha. I taught Al how to make great turkey gravy my Nana's way last thanksgiving! I love the color of your yarn. I was going to order some of that "TOFUtsies" yarn but the postage held me back. I have some yarn with bamboo in it and it makes the softest socks. Very nice of you to do that!